Each year the Winnipeg Humane Society receives hundreds of calls about animals locked in vehicles. These unattended pets are at risk of heat stroke, brain damage and even death. When you support WHS Paws in Motion, presented by Fairmont Winnipeg, you’re supporting the WHS Emergency Response Team who is tasked with protecting these animals from danger. Payworks, the official Emergency Response sponsor of Paws in Motion, supports their hard work. There’s no safe temperature to leave a pet inside a vehicle, even if its parked in the shade and the windows are partially down. This is because our pets do not have the ability to sweat as efficiently as humans. A dog is left with limited options to cool itself down and largely relies on panting to regulate body temperature. 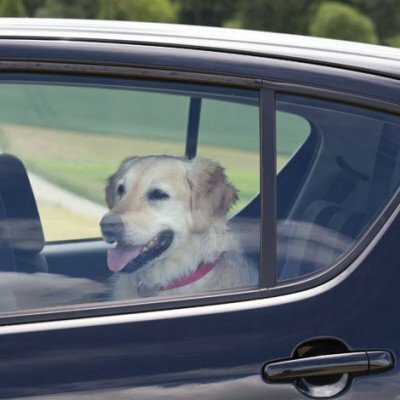 However, an animal’s internal body temperature vastly rises when panting in hot air from the locked vehicle. Signs of a dog in distress include: excessive panting, drooling, dark pink/purple tongue, lethargy, behaving frantically or loss of bowels. I’ve found a pet inside a hot vehicle. What do I do? Take note of the make, model, location of the car along with the breed and condition of the animal. Try to locate the owner. Approach nearby businesses and ask them to make an announcement over their PA system. If the dog is displaying signs of distress, call the WHS Emergency Response Line at 204-982-2020. 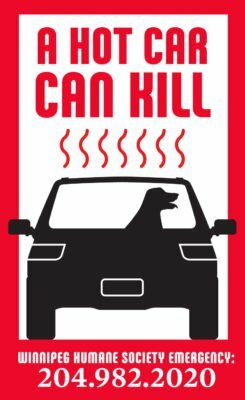 This ‘A Hot Car Can Kill’ decal is available for a donation at the WHS, Petland and River City Ford. You can share the message ‘A Hot Car Can Kill’ on your own vehicle. Donate for a car window decal at the WHS Pet Store, River City Ford or any Petland location in Winnipeg. You can also support the WHS Emergency Response team by attending WHS Paws in Motion. Walk and celebrate pets at Manitoba’s largest celebration of pets with over 1,000 animals and people gathering at Assiniboine Park for a pet-friendly walk and family fun activities on June 24. No pets? No problem! You’re still welcome to attend and say hi to a bunch of new animal friends.